Tres leches cake is a favorite throughout Latin America. The name tres leches (three "milks") comes from the 3 different kinds of milk (condensed milk, evaporated milk, and cream) that soak into this cake after it bakes, making it rich, dense and intense! Tres leches is typically served cold, tasting like ice cream has just melted into your cake. It's a great dessert for hot weather. Some people top tres leches with Italian meringue, and others prefer to use whipped cream. This strawberry tres leches cake has a layer of strawberry filling between the cake and the whipped cream, and is topped with strawberries and blueberries (or whatever fruit you choose, peaches and raspberries would be good, for example). The red, white, and blue colors of the berries and whipped cream are perfect for the 4th of July. Line the bottom of a 9 x 13 inch pan wIth parchment paper. In a standing mixer, beat the eggs with 2 2/3 cups of the sugar until light in color and thick, about 5 minutes. Stir in 1 tablespoon vanilla and the almond extract. Fold the dry ingredients into the egg and sugar mixture, alternating with the buttermilk. Fold gently and do not overmix. Spread the batter into the pan and bake for 30 to 40 minutes, until a toothpick inserted into the cake comes out clean, and cake just starts to spring back to the touch. While the cake is baking, prepare strawberry filling: Rinse 1 pound of strawberries and remove stems. Cut strawberries in half and place them in a saucepan with 1/2 cup sugar and 2 tablespoons corn starch. Heat strawberries over medium heat, mashing them gently and stirring them with a spoon. Bring to a boil and simmer for 3 to 4 minutes. Remove from heat and strain through a fine mesh sieve, using a spatula to force strawberries through, into a bowl. Let cool. When the cake has cooled for about 5 minutes, use a skewer to poke holes all over the surface of the cake. Whisk together the condensed milk, the evaporated milk and 1 1/2 cups of the cream, and pour over the hot cake. Refrigerate cake for 2 to 3 hours or overnight, until chilled. 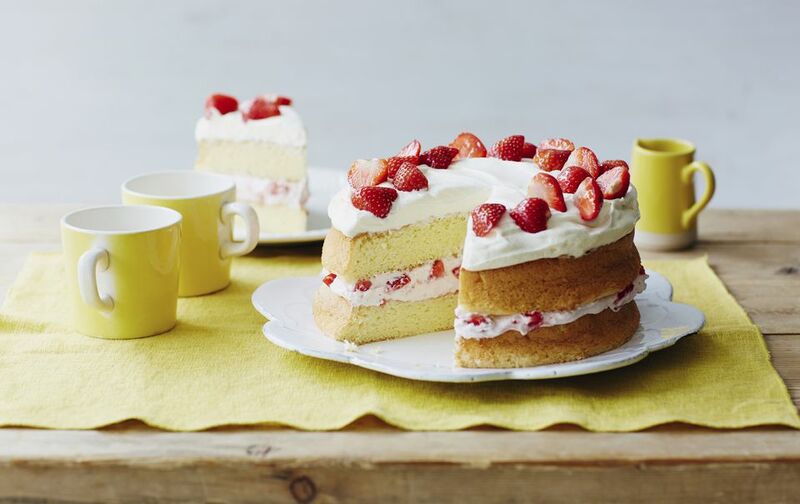 Beat remaining 1 1/2 cups of whipping cream with 2 tablespoons of sugar, 1 teaspoon vanilla, and a pinch of salt until stiff peaks form. .
Leaving cake in pan, spread strawberry filling over the top of the cake. Spread the whipped cream over, covering the strawberry filling. Decorate cake with strawberries and blueberries. Keep chilled until ready to serve.